You may read our websites pages on the strong motivational powers of the 8 Octalysis Core Drives for human motivation (here and here). But how do you use that knowledge to design a really engaging and succesful Gamification product? Well, you need the Octalysis Strategy Dashboard! 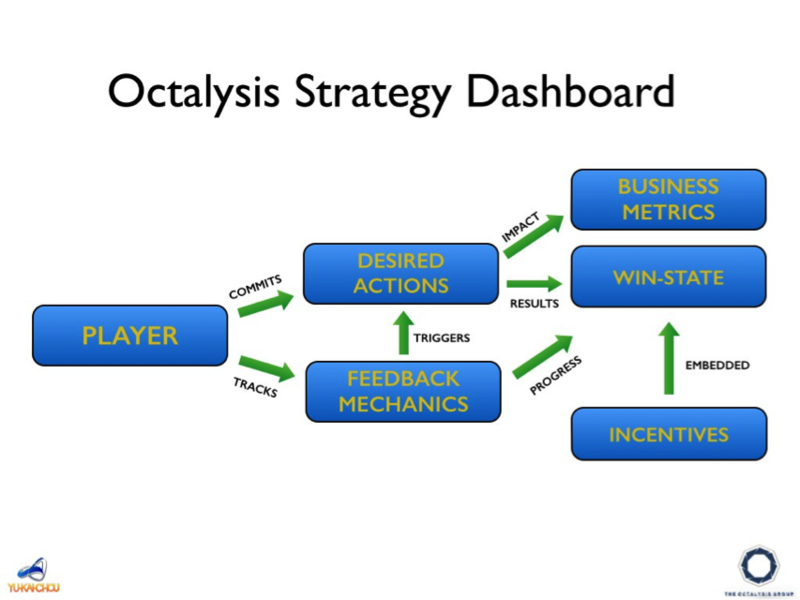 The Octalysis Strategy Dashboard is a constantly evolving document that clarifies the most important aspects of a Gamification campaign. It focuses the attention on the critical elements that will ultimately direct your efforts for maximum impact. The Strategy Dashboard should provide a minimum amount of critical information to help clients execute an actionable Gamification campaign to drive their business metric goals. Business Metrics are the key numbers and results that the business wants to improve on. These are high-level items that the company may present to their executives or investors in order to show the campaign’s success. Some Business Metrics are the numbers that indicate success for your business. They include Revenue, Daily Active Users over Monthly Active Users, Conversions, Time Spent on Site, Retained Users, Registrations, etc. If these numbers are growing, your business is in good shape. When defining Business Metrics, make sure they are quantifiable and prioritized in order of importance. We need to be able to track success, benchmark against other campaigns, and even run split tests to see which of your efforts produce the best results. Business Metrics also needs to be prioritized in the order of importance to your business. If you try to get users to do everything on one screen, users will face decision paralysis, leave your site, and go back to their comfort zone. If by implementing a gamified campaign, your Business Metrics have not improved, then we have failed the Game Objective. Users are the second element to define within the Octalysis Strategy Dashboard. Whatever model we use, we need to ensure that we define user categories based on how they are differently motivated. We don’t want groups that seem different, but are motivated in a similar fashion. This will make it more difficult to optimally design Desired Actions for the Win-State. Once users have been identified we can start to apply custom Octalysis Charts for all these players using the Octalysis Tool (this can be found at http://www.yukaichou.com/octalysis-tool). By considering which of the 8 Core Drives motivate which user types more, we can then identify and implement game elements that appeal best to those Core Drives. By understanding why the user does not take the desired actions, one can address it authentically and constructively engage the issue instead of chasing around the bush on topics that are irrelevant to the user. Once the Users are defined, we have the Players for the gamified system. Desired Actions are the third element to define in any Octalysis Gamification campaign. Desired Actions are the little steps we want users to take such as: go onto the website, fill out the form, register, come back every day, click on the ad, sign up for the newsletter, etc. 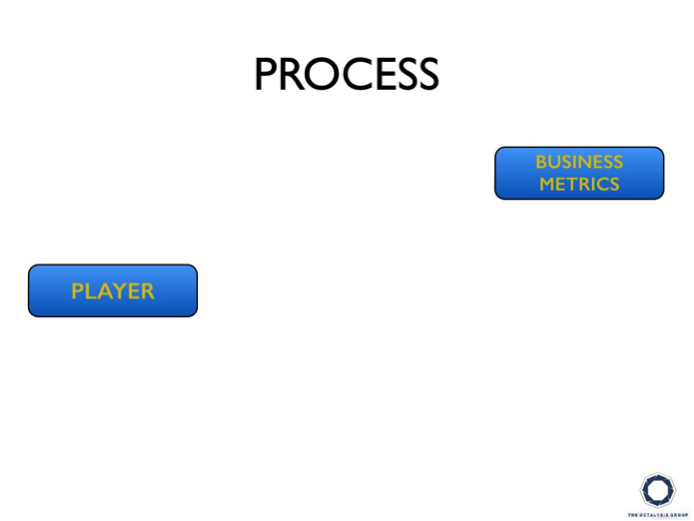 Whereas the Business Metrics are laid out in the order of importance, we want to lay out all the Desired Actions in chronological order based on the player’s journey. This is important because oftentimes what happens ten minutes before a Desired Action will significantly affect whether the user will do it or not. One thing to remember when defining Desired Actions is that no action is too small to be included. 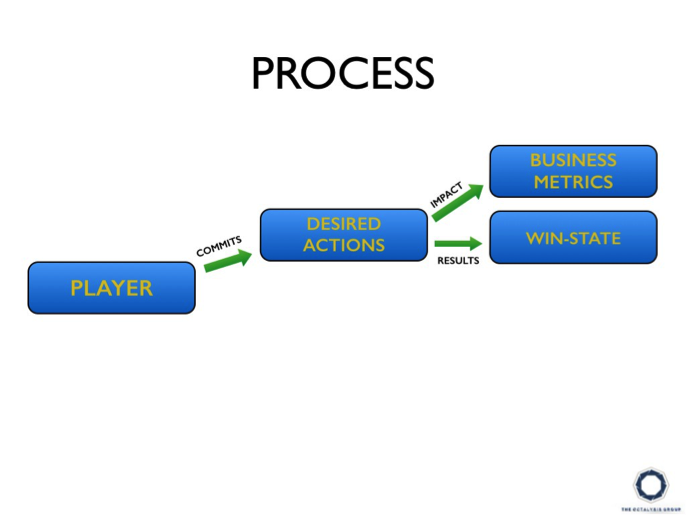 In Octalysis Gamification, each Desired Action leads to a Win-State. This means that every time the user commits the Desired Action, she has reached a Win-State and may receive some type of reward. Whenever we are designing a gamified campaign, the Win-State in the user’s mind should always be accomplished by committing the Desired Action, which increases your Business Metrics. These three elements should always be aligned. And this, again, is actually the core difference between Games and Gamification. Games can simply be fun and engaging, but Gamification has to improve your Business Metrics, and it has to drive behavior towards a certain productive activity. One of the key practices to define your Win-States is to identify the First Major Win-State. The First Major Win-State is when a User first says, “Wow! This service/experience is awesome!” If your experience does not offer any Major Win-States, your experience is not emotionally compelling. Once the First Major Win-State is determined, we want to count exactly how many minutes it takes for users to reach that First Major Win-State. With every second that goes by before a user hits the First Major Win-State, there will be dropout. The longer it takes to reach this experience, the higher your dropout rate will be. Creating a profile is not a First Major Win-State. Uploading a photo is not either. If it was 20 years ago, uploading your photo might be a First Major Win-State. “Wow! I can see my photo on a screen!” Not in today’s world, unfortunately. Strong Win-State design is critical for the success of a Gamification campaign and their identification and masterful creation is fundamental in Level 4 Octalysis. Feedback Mechanics are the fourth element to define in any Octalysis Gamification Campaign. Feedback Mechanics are cues (often visual, but can be audio or use other senses) that users have to keep track of their progress towards the Win-State. These often come in the form of points, badges, levels, trophies, progress bars, and even avatars. In the end, Feedback Mechanics are meant to Trigger users to commit more Desired Actions. User Metrics should align as much as possible with the Desired Actions and the Business Metrics. They should also be what users actually care about. Again, no matter what the Feedback Mechanics are, they should motivate users and be relevant to the flow of the experience. In addition, they should all be Triggers for users to further take the Desired Actions. Incentives are the fifth and final element to define in the Octalysis Strategy Dashboard. Incentives are basically what we can give users within our power that rewards their behavior and entices them to further action. 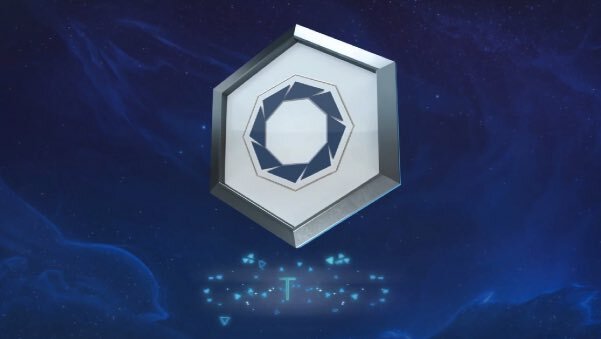 After we have determined what we can give users, we want to strategically place these incentives in the different Win-States that we have designed to motivate players to feel great about committing the Desired Actions. These Incentives become Rewards in a game. Rewards do not have to be merely physical rewards such as gift cards or cash, which is what most companies like to think about. Rewards can be physical, emotional, intellectual, or even spiritual. A catchy and easy model to think about in terms of rewards is Gabe Zichermann’s SAPS model: Status, Access, Power, Stuff. The interesting thing about SAPS, is that as you go from Status to Access to Power to Stuff, the reward becomes more and more expensive for the company, but less and less sticky for the user. It doesn’t cost us anything to tell you that you are amazing and you’re the #1 User on my site, and you will likely be excited about it for weeks or months and tell all your friends about your new status. But if we gave you cash, you likely will become excited for a few hours or a day, and then you may spend the money at a mall and then emotionally forget about it. Now your emotional state is wondering about when you will receive your next injection of cash. Again, most companies like to give their employees stuff to incentivize them but it’s actually a lot more effective if you can figure out how to give them more status, exclusive access, or more power to control their environment.. While SAPS describes the nature of the reward, there’s also a variety of Reward Contexts that can be derived from the 8 Core Drives of Octalysis. Ultimately, these reward contexts are derived from Octalysis, because we are all incentivized by the Core Drives. Even if it’s not something you gain, avoiding a loss or satisfying your curiosity are also very strong rewards that can be strategically placed in every single one of your Win-States. Without them, users will have no reason to commit the Design Actions moving forward. Once the Strategy Dashboard is completed, we will set out to design features for every Phase of the User Journey. Most people treat interacting with a product as one experience but we have to look at a product as 4 different products. The first day a users use LinkedIn, for example, is very different from subsequent days they use the site. Once we have mapped out all features for the main users and all experience phases, we then set out to rate the motivational power these features against the ease of implementation of these features. In addition, we will map out the game structure, game levels and rewards. Finally we will design a suite of visual concept wireframes detailing (frame-by-frame) what the Octalysis Gamification Journey looks like. These wireframes are ready for product development by the art and development team.